From the Star Wars collection by Plasticolor. 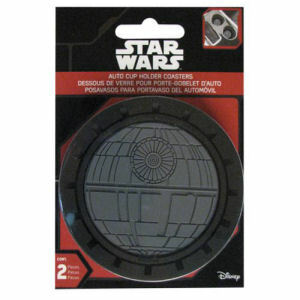 Star Wars Death Star Auto Coaster 2-Pack. This Item is in stock and ready to ship. You should not postpone your purchase and miss out on adding Star Wars Death Star Auto Coaster 2-Pack to your Star Wars collection! From the Star Wars collection by Plasticolor. Star Wars Death Star Auto Coaster 2-Pack. Each coaster measures approximately 3.25 inches in diameter and can be trimmed down to fit your cup holder.